The DRECP is focused on the desert regions and adjacent lands of seven California counties - Imperial, Inyo, Kern, Los Angeles, Riverside, San Bernardino, and San Diego. The Plan has been prepared through an unprecedented collaborative effort between the California Energy Commission, California Department of Fish and Game, the U.S. Bureau of Land Management, and the U.S. Fish and Wildlife Service also known as the Renewable Energy Action Team (REAT). The DRECP will result in an efficient and effective biological mitigation and conservation program providing renewable project developers with permit timing and cost certainty under the federal and California Endangered Species Acts while at the same time preserving, restoring and enhancing natural communities and related ecosystems. 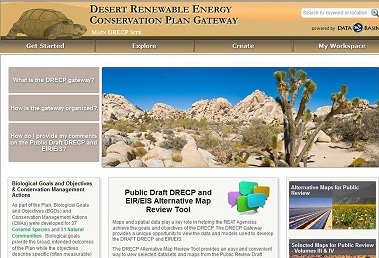 Approximately 22.5 million acres of federal and non-federal California desert land are in the DRECP Plan Area. The DRECP Gateway leverages the power of Conservation Biology Institute’s Data Basin, a science-based mapping and analysis platform that supports learning, research, and sustainable environmental stewardship. The Gateway provides a unique opportunity to view the data and models used to develop the DRAFT DRECP and Environmental Impact Report/ Environmental Impact Statement. As a member of the DRECP Gateway, users can download scientifically-credible datasets, upload datasets as public or private, and create and save maps. Users can also access a private workspace or create public or private galleries to organize content and form groups for collaboration and data coordination. The Gateway also allows, for the first time ever, public access to the spatial data used to develop the DRECP and the option to use decision support tools to assist in the development of comments for the public comment period. The DRECP gateway was officially launched September 26, 2014.